Abbey Wells, a local photographer, and her husband Kevin share their 1959 ranch home with their two dogs (Lucy & Ladd) and cat Birdie. The couple moved into their home just a few days after getting married and have now lived there for over two and a half years. 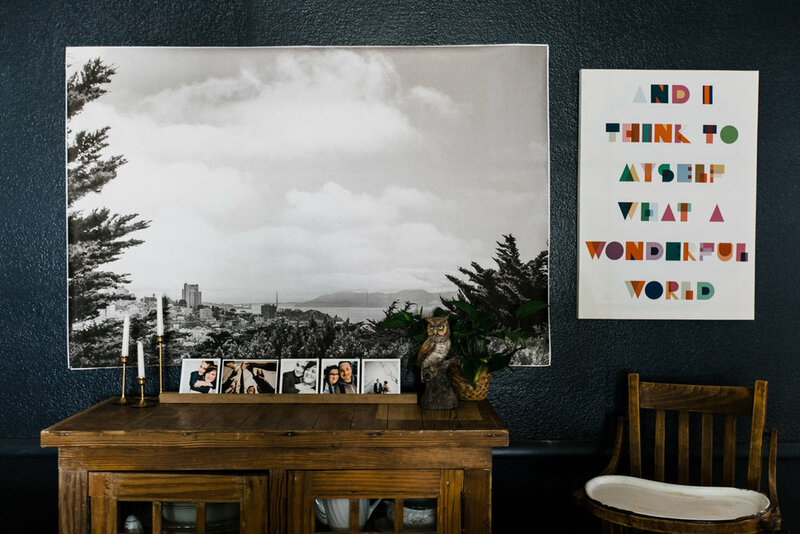 Our Q&A with Abbey as well as a tour of her pretty, colorful home is below–enjoy! What do you love most about your space? That's a massive tie between our large, open front living room and all of the windows in our house. We don't have a single room without a window (Even our tiny laundry room has one!) and, as a photographer (which, when you go to the word roots, is defined as someone who paints with light), it gives me so much life. Plus, windows are kinda essential for the 70 plus plants we have. 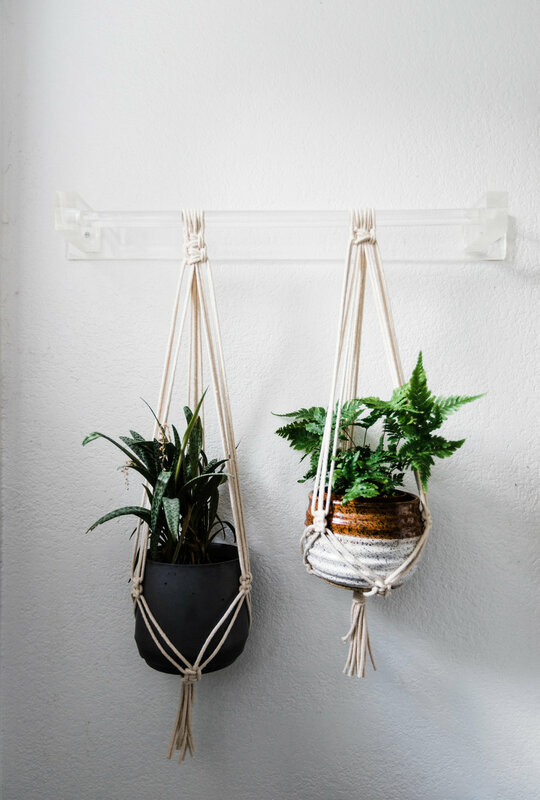 What is your favorite home project you've completed? While not super exciting, I would say that painting both of our living rooms, our kitchen, our bedroom, and my office takes the cake. The living rooms, kitchen, and bedroom all had a tan and/or red paint–painting them drastically changed the entire mood of the room. When I painted our back living room, which is where our TV is and where we spend the most time, Kevin would not stop saying how calm and peaceful the room was. Paint makes such a difference, and I'm glad that we invested lots of hours into it. I also made a goal to get more of our photos in tangible form in our home. I didn't realize that I had actually done pretty good on that goal until I started to prepare for this home tour, so I'm proud of that project, but still have plans to add more. You decorate with objects that have meaning and history. Tell us about one of these special pieces. Just one? I can't choose–so I'm going to share about three (sorry). First, there's the vintage high chair that my grandfather found and bought for my mom when she was pregnant with me. I used it as a baby, and it now sits in our dining room. Since we don't have kids, it usually goes unused, but our youngest nephews and our neighbor, Petra, have all used it when they've had dinner at our house. I dream of when our own kiddo will use it someday. Second, there's a cabinet behind our dining table that was gifted to me from my grandparents (the same one that bought the high chair). They found it at an estate sale in a craftsman home, and it was one of two cabinets that flanked the fireplace. You can still see where a pillar once sat atop it. This cabinet was in the room that I used to stay in at my grandparents’ house as a kid with my cousin, Hailey, and I love that it's now a part of my home. Third, is a side table that sits in our front living room. I bought it at River City with my mom the day after my first date with my now-husband. I hadn't told my mom about him and our date until we were loading it into the car, but I did not tell her then that I already knew that I was going to marry him. Oh! And this precious cat teapot that my husband brought home to me when he randomly stopped at an estate sale after work, and it made him think of me. I love it more than him bringing me roses (although that's nice too, Kev!). I also have a collection of teapots gifted by both of my grandmothers (one being a coveted Jewel Tea), my great-grandparent's wedding picture in the original art deco frame and the cameo necklace my great-grandmother was wearing in the picture (gifted to me by my grandma), a piece of my grandmother's turtle collection, and for my high school graduation, my grandpa gave me the first camera they had as a couple, a Brownie Six-16 (As a photographer that's all about family history, that's a BIG super-sentimental gift.). I've also got lots of pieces that were once in friends' homes, and they remind me of the times that I spent with them. Ok, that was way more than one, or three. Sorry, but I'm very sentimental about the pieces that are in my home and love the stories behind them. We know you love thrifting and vintage shopping–tell us about your favorite find. As I'm sitting in my front living room, I would say that it's three things in my view right now–my 8-foot long dining table from Retro Den (that was absolutely the best deal ever), my Steelcase sofa and love-seat with camel-colored vinyl cushions from Retro Den, and a rolling cabinet in my entryway that I found at River City about four years ago and repainted white. The cabinet has been a coffee bar, a plant stand, and now a place to put our keys and mail and to store overflow decor that I love, but have yet to find a place for. Also, a few weeks ago I was watching Mr. Rogers' Neighborhood with some kiddos I watched this summer and when they panned over his dining table-it looked just like mine! So that's pretty neat that Mr. Rogers and I had the same dining table. Favorite places to find furniture and home decor in Tulsa? Seeing as (at least) 70% of my furniture and decor is from Retro Den, I would say that it's my favorite. I grew up in Jenks, which is often referred to as the "Antique Capital of Oklahoma," and so I very literally grew up in the antique stores lining Main Street in Jenks. My mom and I would often be found in Abbey Road which I adored (Can you guess why? ), but it no longer exists, and Miss McGillicutty’s, but River City Trading Post was, and is, our absolute favorite. While I don't make it out there much anymore, I still love to spend hours walking through the many aisles of River City with my mom, always starting on the far right of the store and working to the left. Where do you get inspiration for decorating your home? So much of my style comes from my mom, who has been mixing old and new for as long as I can remember. 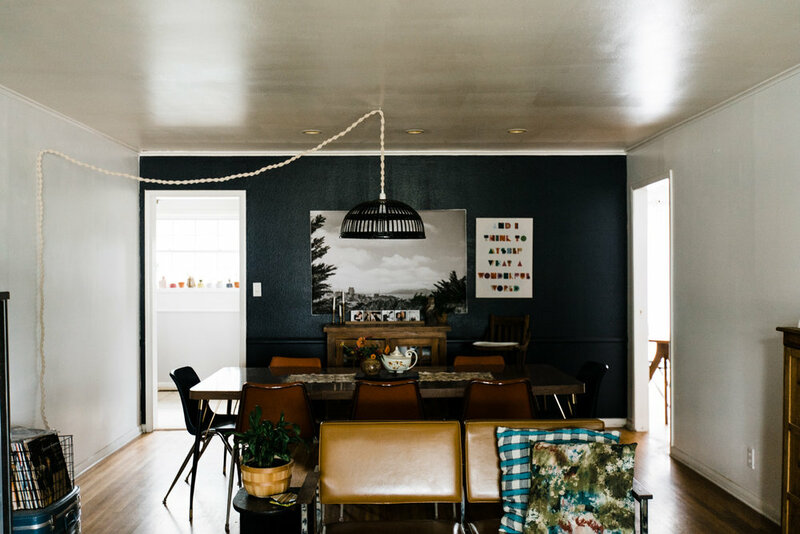 She instilled a love of vintage pieces within me, and that definitely influences what I choose for my home. 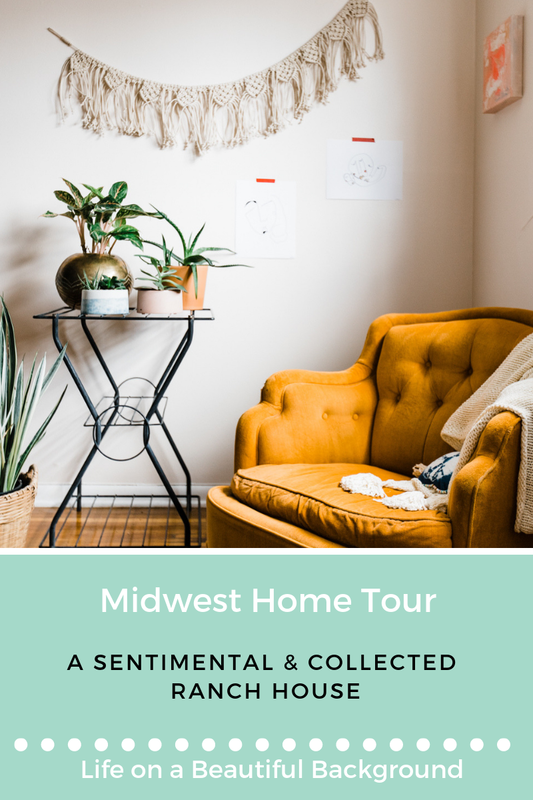 For years before I owned my own home, I would spend hours on Pinterest dreaming of what I would like for my home, but now I don't really find myself looking for inspiration. Rather, I think that I let my space and beloved pieces be my inspiration. However, I would say that if I get inspiration from anywhere, it's Retro Den. How would you describe your decorating style? Midcentury-industrial-eclectic with blues, warm colors, and plants? 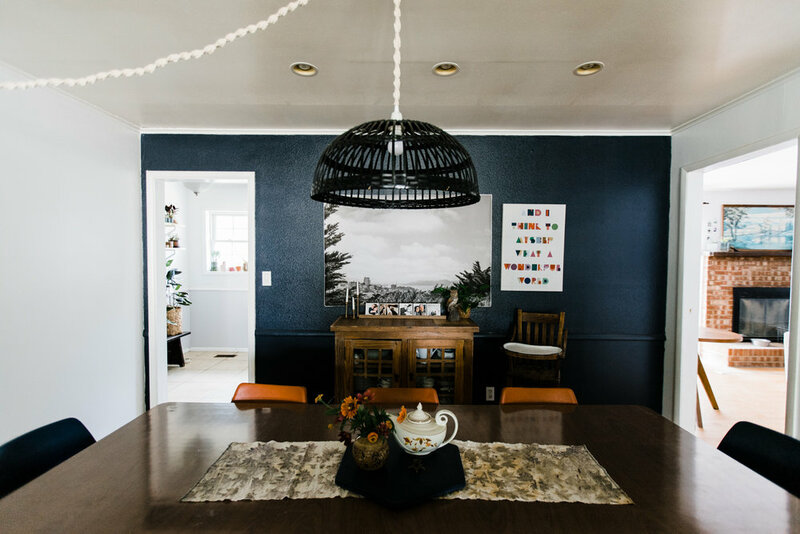 I don't focus on staying within a specific "style" when I decorate, but rather make sure that whatever I'm adding to our home is something that I love, something that Kevin wouldn't mind, something that I can imagine in our home, and something that's practical. 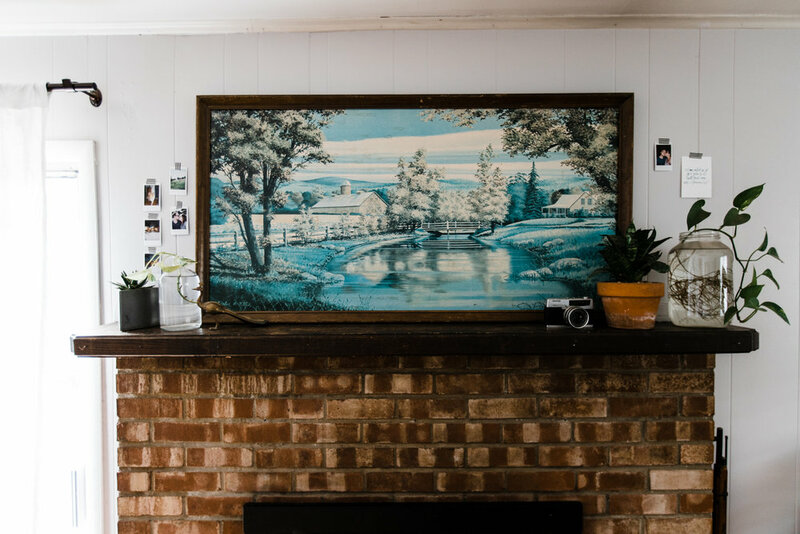 Why do you think it's important to have vintage pieces in your home? There's something so wonderful about having a piece that very few people have and to know that it's lived a full life in other homes. 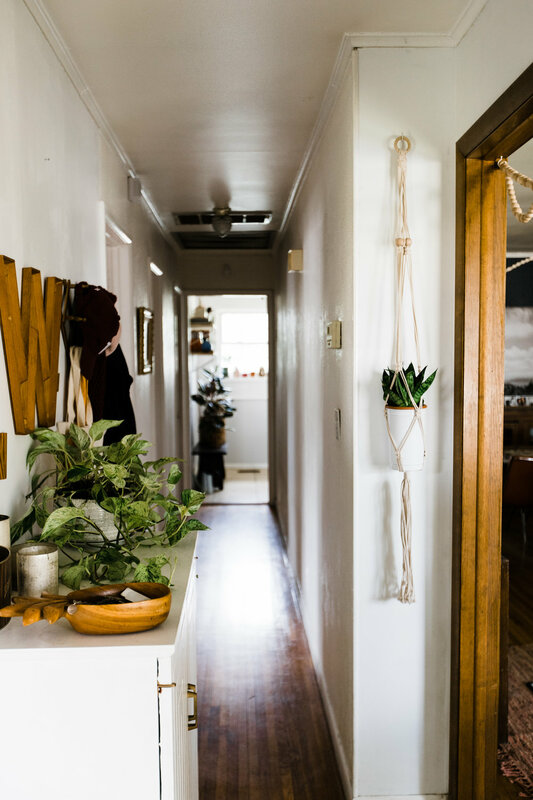 I like to think about what kind of space it was in when it was brand new, and then admire it being used in a different way in my home, adding character and warmth from its full life. There's also something to be said about the search for the perfect piece. It's thrilling because sometimes you don't find anything, and then sometimes you find something that you just have to get–because who knows if you'll find something like it again! I can count on one hand the number of non-vintage pieces in my home. 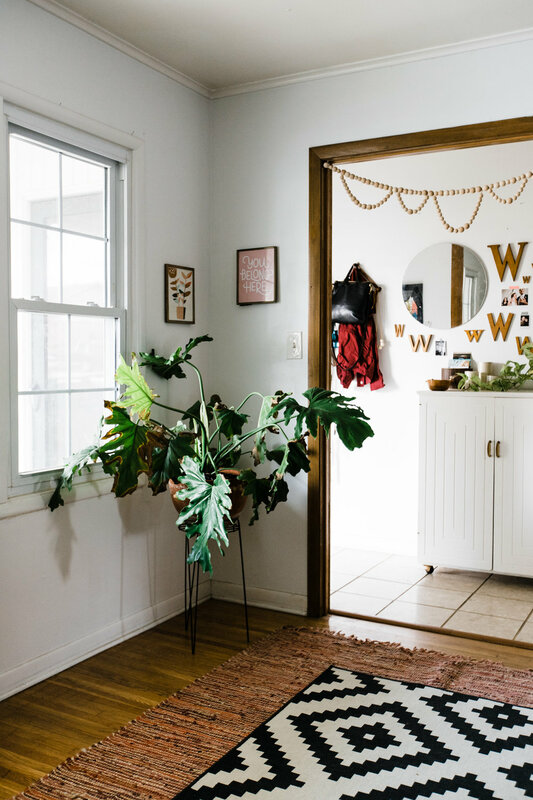 While I like new pieces, all-new vignettes (like you would see at big box stores) seem to be missing something, and for me, that's vintage pieces. Also, most of the new pieces of decor in my home are handmade by friends or myself. I find it really wonderful to look around my home and see the pieces that I found at my friends' store, that my family has passed down, that my friends made, or that my friends taught me to make! Why do you think it's important, worthwhile to have a beautiful home? As an introvert who needs to recharge in my own space after being out in the world, I really need that space to bring me peace and refresh me, rather than make me more tired. 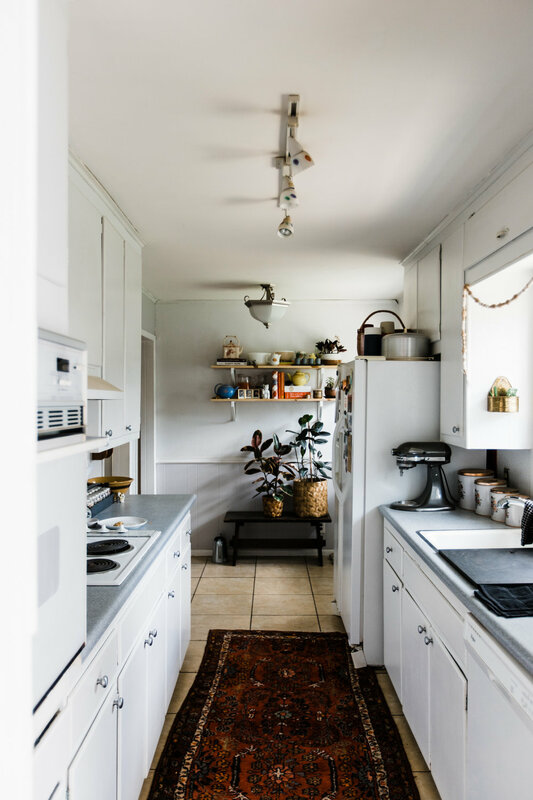 It's taken about two years to get our home to the place that it is–with a lot of hunting, swapping out not-so-perfect-pieces for the right ones, deep cleaning, getting rid of clutter, and rearranging. 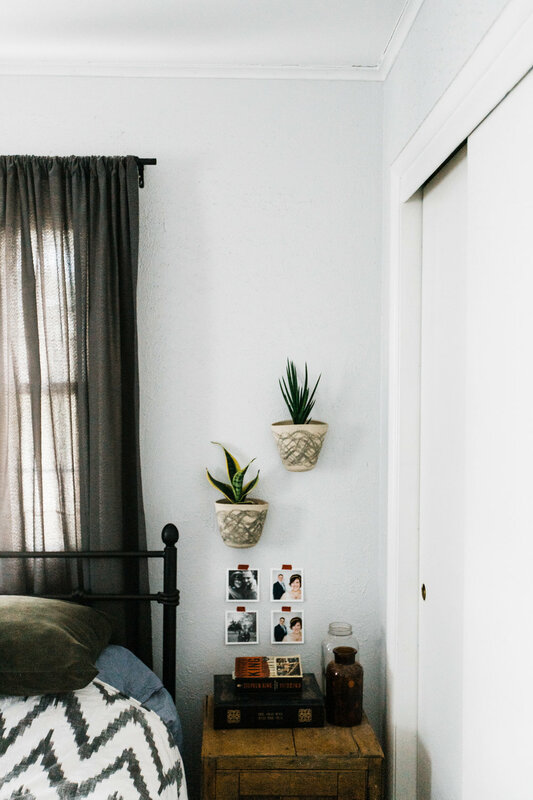 There's still work to do, specifically in our bedroom and guest room, but every room that we spend time in has some beautiful and pleasing element that brings me peace and rest–even when the dishes and laundry have piled up. Now that I work from home, I'm especially thankful that I put so much effort into finding the right pieces, adding lots of plants, incorporated more family pictures, and moved around decor until it was right. For a while I really disliked the way our home looked, but now I love walking through all of the rooms. I love coming home and being home, and that's so important for my mental health. What do you love about Tulsa right now? Well, the Gathering Place just opened…so...But really, Tulsa is amazing for so many reasons–not just the super-cool new park. The biggest thing that I personally love about Tulsa right now is the community–especially the small business community. As a small business owner myself, I'm so thankful for the other small business owners that I've met (usually through Retro Den) and now call friends. Starting and owning a business is not easy at all, and being surrounded by other people that are working for their dream of working for themselves is so encouraging and something that I covet so much. 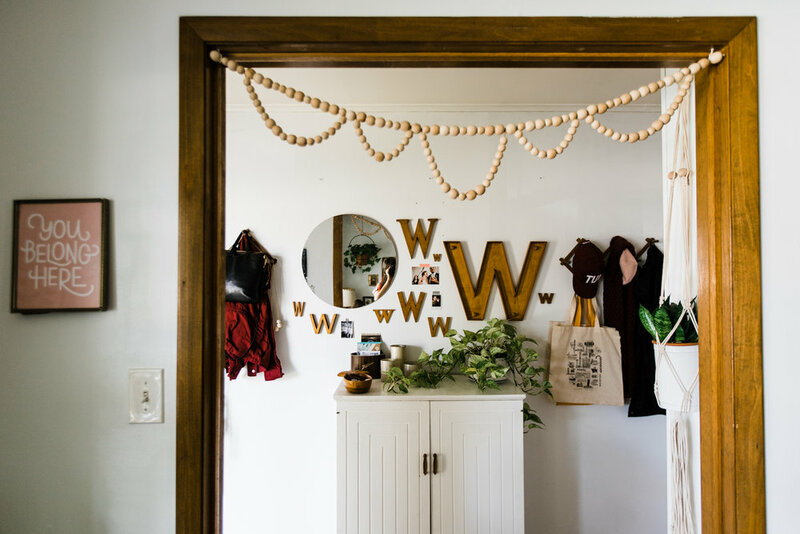 I love knowing that I can walk next door for that community (Drew + Mel of the Makerage are my neighbors), go to Retro Den to find five women-owned businesses and many other local makers, or head to Foolish Things where I usually encounter more friends. Tulsa is a wonderful and supportive town for small businesses, and I love seeing small businesses growing here. We do collaborative interior design. We provide a fresh perspective & helping hands!